Are you Irish and getting ready to celebrate St. Patrick’s Day? Maybe you just love all things green? 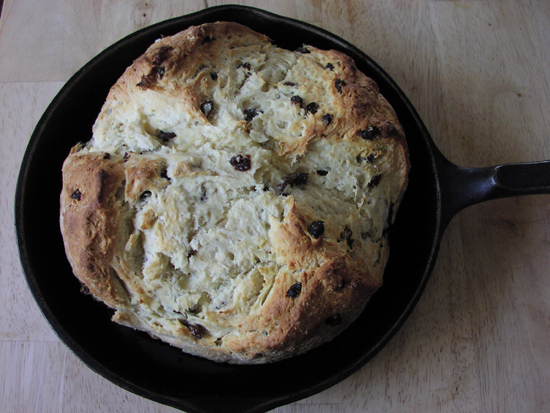 Every year at this time you can find beautiful displays of Irish soda bread at the grocery store. Hmm, the sample at store tasted so good this year. But at $4 for a very small loaf we passed on it. Instead of buying a loaf we decided to have a go at making our own this year. 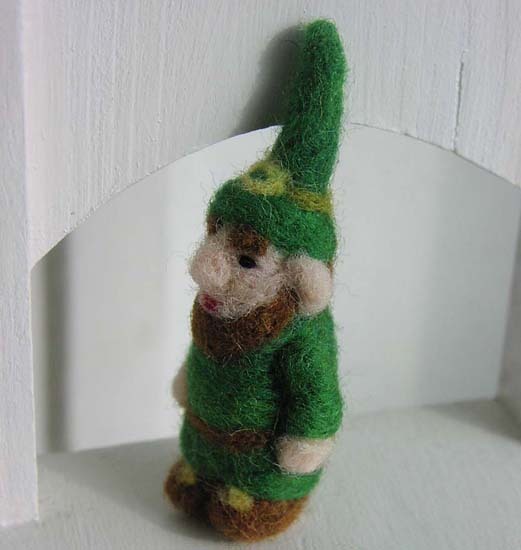 This little Leprechaun guy told me soda bread is not that hard to make. Should I believe him? Step 1: Set the oven temperature at 425 Fahrenheit. 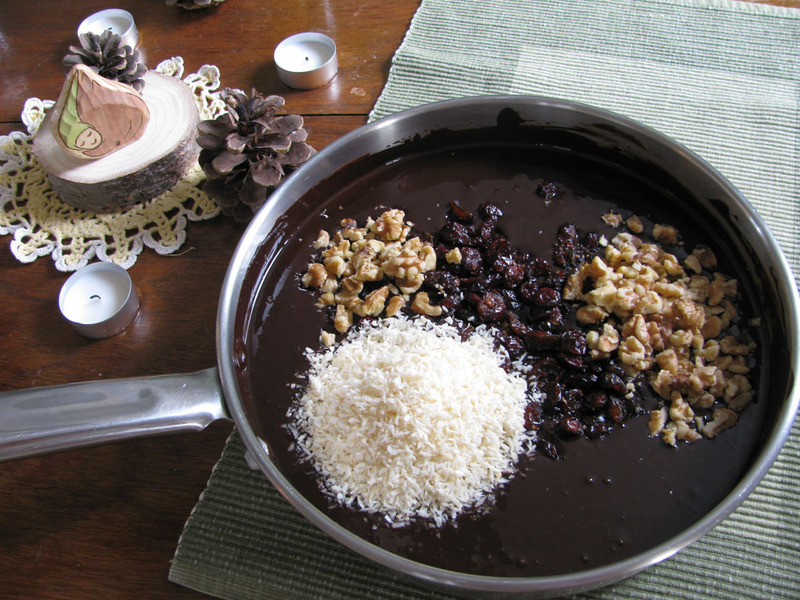 In a big mixing bowl combine the dry ingredients (except the raisins). 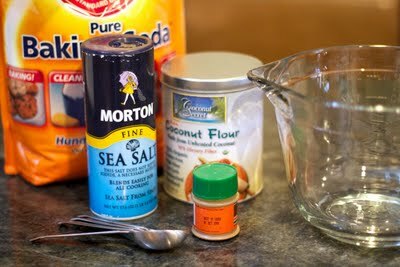 Mix flour, sugar, salt, and baking soda together with a spoon. Step 2.: Cut the butter into small chunks and add to the bowl. Incorporate butter using your fingers or a pastry cutter. Work the butter into the flour until it looks like course meal. Then stir in the cup of dried raisins. Step 3: Make a well in the center and pour in the beaten egg and buttermilk. Stir until you get a sticky dough. 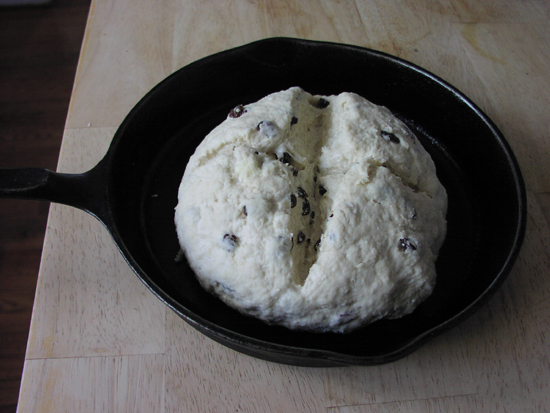 When you can’t work it any more with the spoon use your hands to shape the dough into a ball. Turn it out onto a floured surface where you can knead it a bit more. Be careful not to knead it too long or you bread might end up too tough. Step 4: Lightly grease a cookie sheet or bake your bread in a greased skilled ( that’s what we used). Take a serrated knife and cut an x-shape into the top of your bread. Sort of making it look like a big hot cross bun. You want to cut rather deeply, about 1.5 inches deep so your bread gets baked properly. I baked this loaf for 30 minutes. After 25 minutes I had to put some aluminum foil on top so it would not get too tan. We just pulled it from the oven and chewed halfway through the loaf. Yummy it’s really good. It was very easy to make too. Next week I want to try the whole wheat version. So stay tuned for a healthier version..
My 10-year-old really enjoys cooking these days. 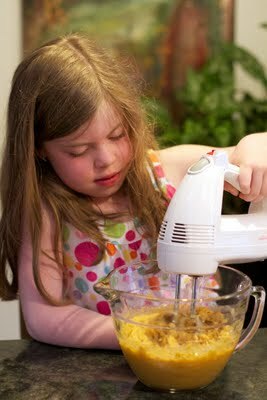 She found a recipe for waffles that she has been bugging us to make for months. The ingredients sounded good to us. But it sounded all a bit involved. Don’t you just love the kid cookbooks where it says “ask an adult for help”. This Sunday was the day she convinced us to help her. 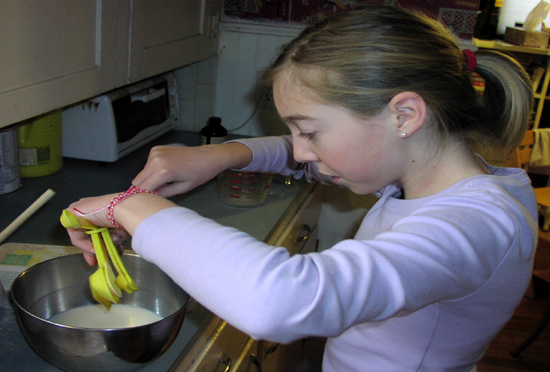 The recipe, or waffle project, came from Kit’s Cooking Studio, an AmericanGirl cookbook… Kit is the AmericanGirl Doll character whose story is set in the Depression era. Accordingly, the recipes revolve around that topic. So it’s really fun to learn a bit of history while cooking. Step 1. Put the flour, corn meal, baking powder, and salt into a sifter. What is a sifter, mom? Hmm, we don’t have one. I guess back in the depression era people had to sift everything because there may have been little bugs in your flour. So we didn’t sift our flour and mixed all the dry ingredients in a bowl. Step 2. Put the milk, honey, and vanilla in another bowl. Step 4. 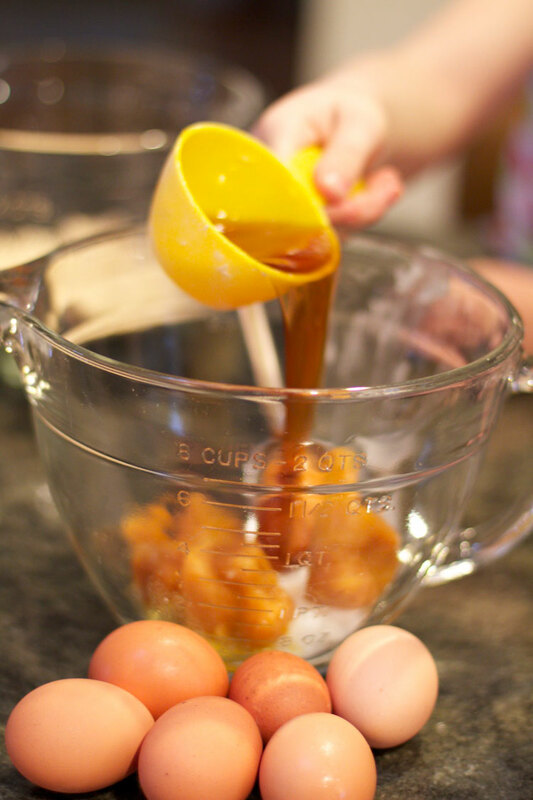 Mix the egg yolks into the wet ingredients (bowl with the milk in it). Step 5. This step was followed by the next disaster. The recipe goes on telling you to stir the wet mixture into the dry flour mixture of ingredients. Huge mistake! We instantly got big lumps. Years of cooking and baking have taught me that it’s always better to put the dry ingredients and stir them into the wet ingredients. Why did we not follow our instincts and do it that way? Dad had to come to the rescue and get the hand mixer out to take care of the lump situation. Step 7. Next you are supposed to fold the egg whites gently into the batter. Some lumps of egg white are okay! Step 8. Last, have your adult slave put the Waffle mix into the preheated waffle iron. Well, that’s when the whole project went totally South. 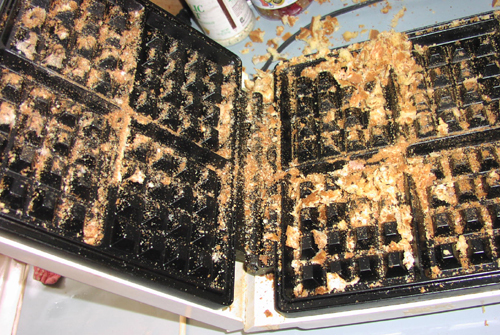 The batter stuck to the waffle iron so badly that we could not get it out. See photos. What went wrong? My husband got so annoyed that he wanted to toss the waffle maker into the trashcan. Then came the tears of disappointment. We all started joking that it was a book about the Great Depression after all. I think it’s great my daughter wants to learn how to cook, and I love the idea of teaching history while we do it, but can we please have easier recipes that don’t wipe out the whole kitchen after I spent all of Saturday cleaning my house from top to bottom? We ended up making pancakes with the batter. And let me tell you they were REALLY yummy! 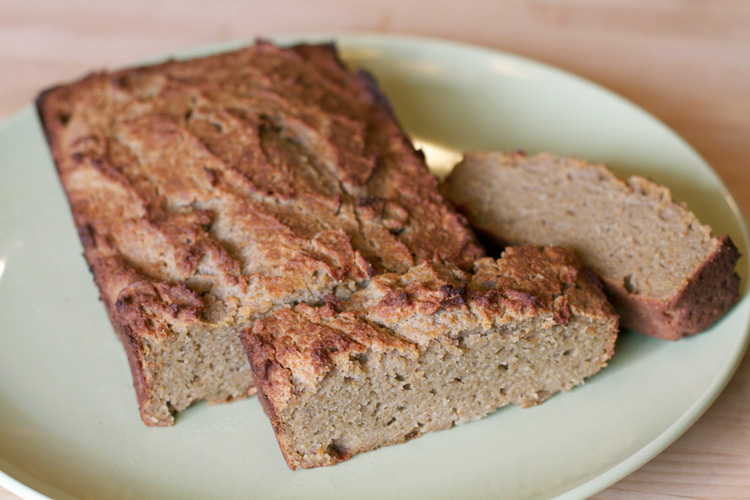 Pumpkin Spice Bread—Heck, Veggie Spice Bread! We are primal in our house, meaning that we don’t eat grains of any kind, and we try to keep our foods as whole as possible. 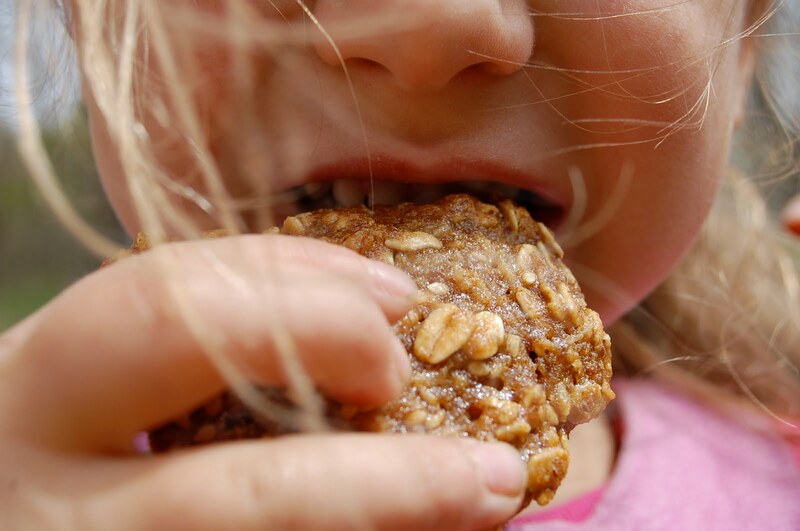 It’s hard for the kids though who tend to be snackers and grazers, and with a busy family schedule we need some “to go” foods. This recipe is one that I make all the time. It’s easy, quick and I can use pumpkin, sweet potato or zucchini, what ever I have on hand. Preheat oven 350. Combine dry ingredients and mix. In bigger bowl combine wet ingredients and blend well. Mix all together. Grease pan with coconut oil, and bake 25-30 min, or until done. 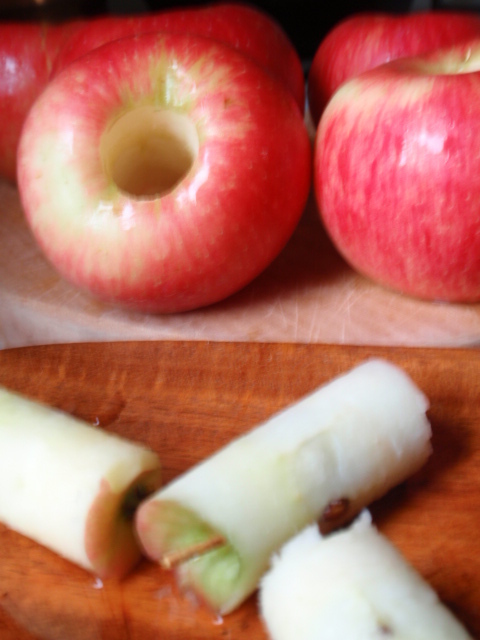 Hope you enjoy making this easy recipe with your kids! But never mind my failures. I found one great recipe that works even at high elevations. It is really fun and easy to make. I make it to go along with soups. 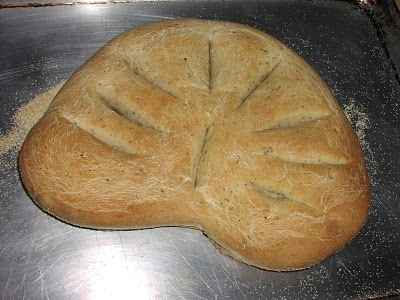 The whole family loves the flavor, and the kids have been intrigued with the bread’s leaf-shape since they were little and started to reach for the bread basket. I found the recipe in a cooking magazine many years ago. It’s been so long I can’t even recall where it came from. But it’s a French style bread called Fougasse. Put the flour, herbs de Provence, and salt in a large mixing bowl. Sprinkle the yeast on top of the lukewarm water in the measuring cup. Let it sit for about 10 minutes. Then add the water with yeast to the flour, add the tablespoons of olive oil and knead everything together. If you have a KitchenAid mixer, you can just stand by and watch as the dough hook does all the work for you. If not, roll up your sleeves and with some elbow grease you can do it. It’s not so bad! Once the you have a nice big ball of sticky dough, put a little olive oil into the bowl and coat the outside of your dough ball with it. Cover with a towel and let rise in a warm place. Rub some olive oil on the loaves of bread right before you put them into the oven! Put loaves in an set the timer for 9 minutes. After 9 minutes switch the two cookie sheets around. The bread that was baking on the top needs to go to the bottom and vice versa. Bake for another 9 minutes or until the bread has a nice color. Can you smell the beautiful aroma of the Herbs de Provence yet? Yummy! It’s so good! And you get two loaves at once. We eat one loaf with our soup. The other I use for fixing school lunch sandwiches. You are probably thinking: Oh no! 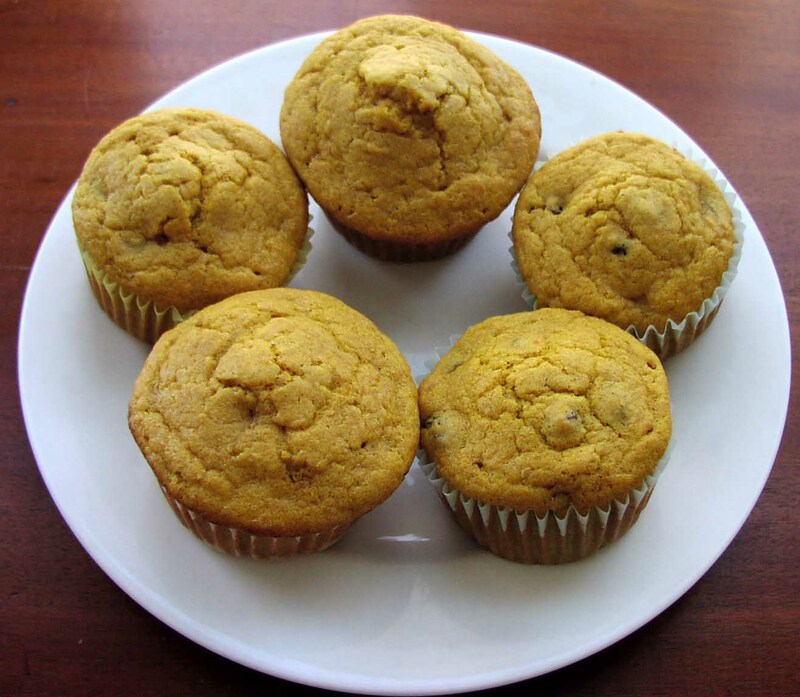 Not another stinking’ muffin recipe! There are so many out there. 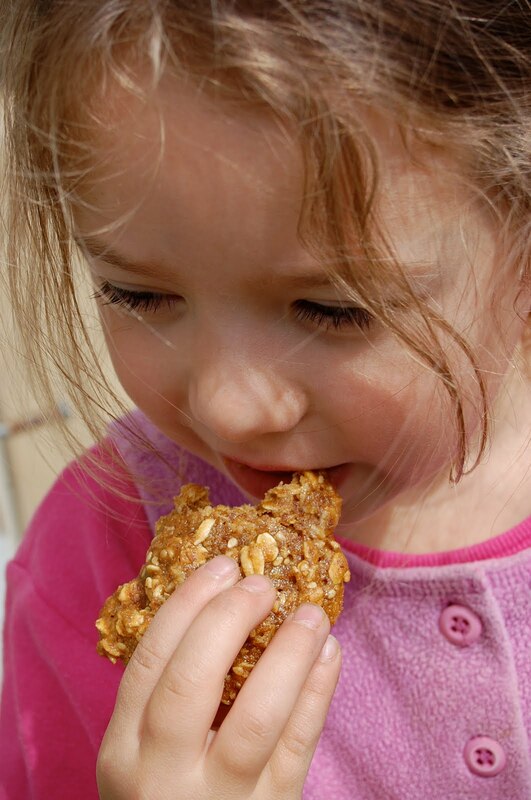 I know there have been a few on the NaturalKids Team blog in the past. But I promise you won’t be disappointed if you try this one. They are so good you will make them over and again! 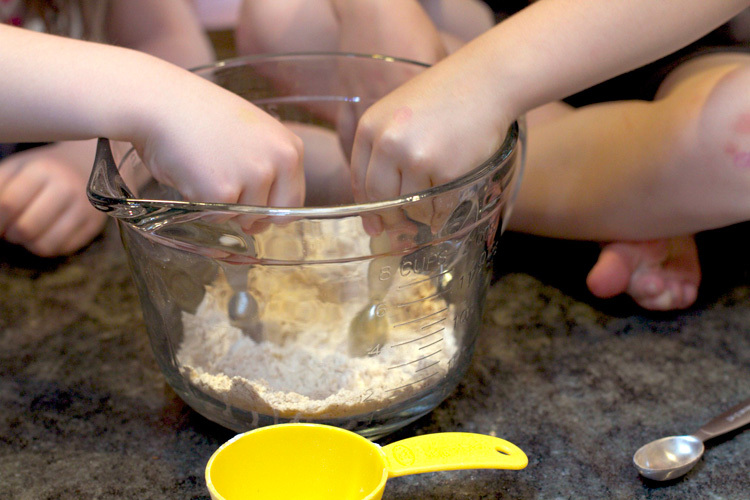 Give your child a bowl and the list of dry ingredients such as the flour, wheat germ, baking powder, baking soda , spices, and salt. My kids really enjoy measuring and mixing things together. It’s such a great way to teach them about measurements and what happens if you get things wrong…But with a little supervision a 6-year old can do this! In another bowl mix melted butter, brown sugar (make sure you work in all the little lumps with a fork! 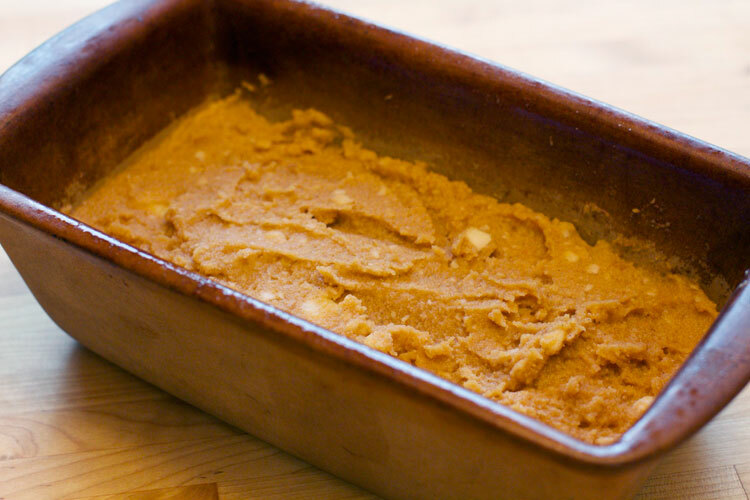 ), white sugar, add melted butter, beaten eggs, milk, and pumpkin pulp. Mix well together. Add the dry ingredients to the wet pumpkin mixture. Throw in the handfuls of raisins. Grease a muffin pan and flour it. You can also use paper cups, but these muffins are very sticky and will disintegrate when peeled off from the paper too soon! So if you want to eat them warm from the pan the greasing option is probably the way to go! Bake for 20-25 minutes in preheated oven at 375 degree Fahrenheit! Today’s recipe (and book suggestion) was originally published by Pamela of Prettydreamer on “Wither Will I Wander”. While under the weather, sick in bed for three weeks (that is, almost the whole month of April) … there was definitely time to read a lot in bed. Homer Price by Robert McCloskey had it’s chance for a second time around read. This time read by my child who could mostly read this sweet book herself. that sweet, slow moving time that children live into. Now about those donuts …. 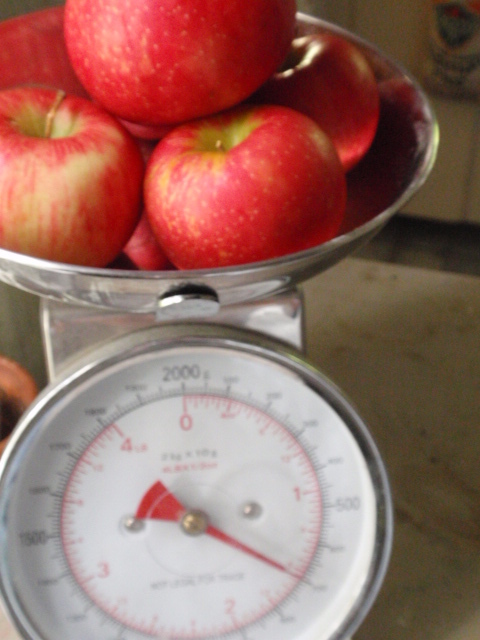 Having no new-fangled, modern machinery at my disposal and not wanting to fry donuts in a quart of oil …. I came across this wonderful recipe for baked donuts. They were very tasty and an important way to end reading about “the donuts”. 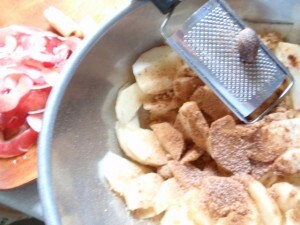 1- Whisk together all of the dry ingredients in a medium-sized mixing bowl. 2- In a separate bowl, beat the eggs, oil and buttermilk or yogurt until foamy. 3- Pour the liquid ingredients all at once into the dry ingredients and stir just until combined. 4- Butter or grease the doughnut pan; non-stick pan spray works well here. 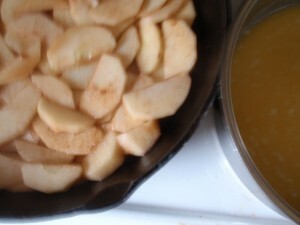 Note: even though the pan is non-stick, since the doughnuts are low-fat they may stick unless you grease the pan first. 5- Fill each doughnut form half full. 6 – Bake the doughnuts in a preheated 375°F oven for 10 to 12 minutes. When done, they’ll spring back when touched lightly, and will be quite brown on the top. 7- Remove the doughnuts from the oven, remove them from the pan, and allow them to cool on rack. 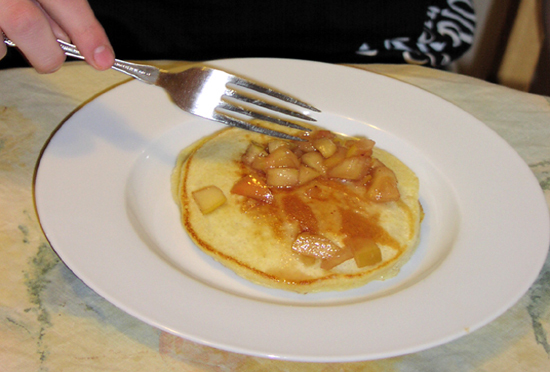 If desired, glaze with icing, or dust with cinnamon-sugar or any non-melting sugar. 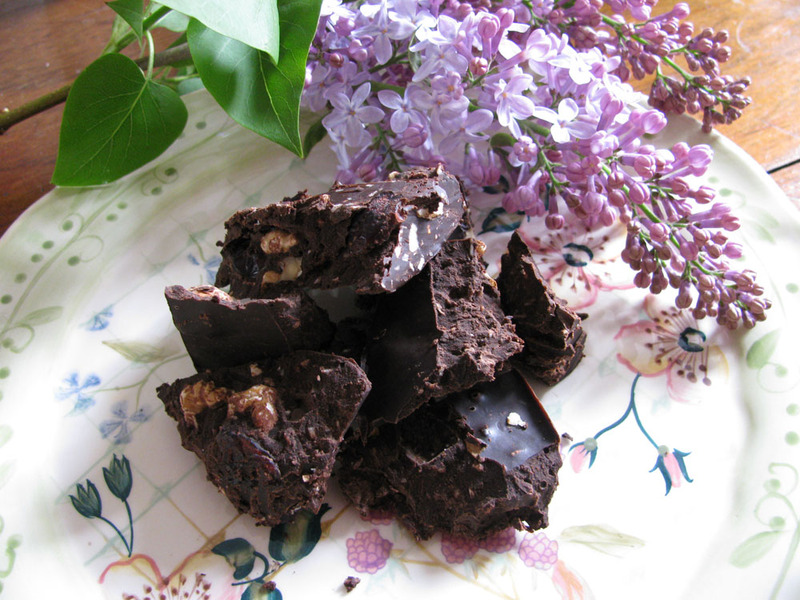 This recipe is originally from the King Arthur Flour website. Today’s recipe was created by Steph from Elemental Handcrafts, full of beautiful earth-friendly handcrafted pieces. 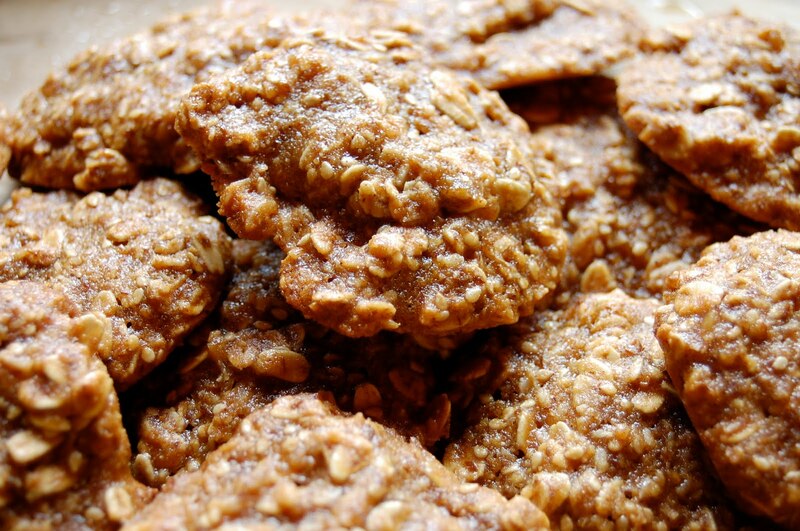 She made these cookies up for her kids to give them a healthy (but so cleverly disguised) snack. Thanks, Steph, for sharing this great new recipe. Preheat oven to 325 degrees and cover two cookie sheets with parchment paper or spray your pan with oil. Add your wet to your dry and mix until well incorporated. Drop by spoonful onto prepared baking sheets and bake for about 15 minutes, until lightly brown. *hint* Measure oil first, then maple syrup and barley malt. The oil left in the measuring cup will keep the malt from sticking. 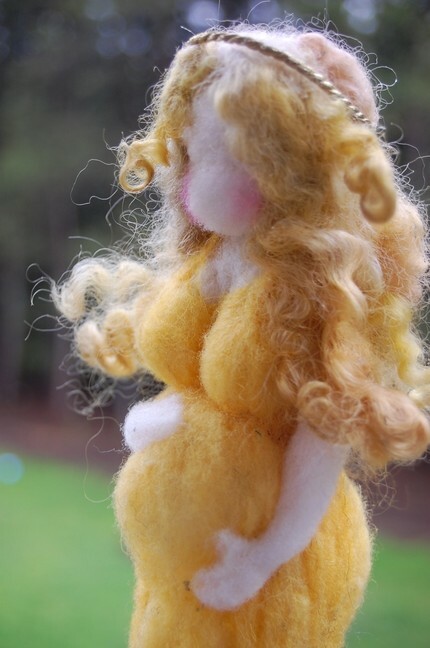 Here is one of Steph’s new beautiful needle-felted dolls!